Jenna Miscavige Hill, niece of Church of Scientology leader David Miscavige, was raised as a Scientologist but left the controversial religion in 2005. 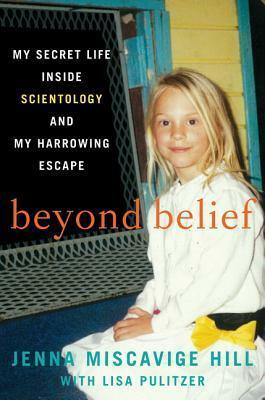 In Beyond Belief, she shares her true story of life inside the upper ranks of the sect, details her experiences as a member Sea Org - the church's highest ministry, speaks of her disconnection from family outside of the organization, and tells the story of her ultimate escape. In this tell-all memoir, complete with family photographs from her time in the Church, Jenna Miscavige Hill, a prominent critic of Scientology who now helps others leave the organization, offers an insider's profile of the beliefs, rituals, and secrets of the religion that has captured the fascination of millions, including some of Hollywood's brightest stars such as Tom Cruise and John Travolta. Jenna Miscavige Hill was raised as a Scientologist. Since leaving the organization in 2005, she cofounded the website www.exscientologykids.com, which features the stories of current and former Scientologists and supports those who choose to leave the organization. She lives in Southern California. Lisa Pulitzer is a former correspondent for the New York Times andcoauthor of more than a dozen nonfiction titles, including the New York Times bestsellers Stolen Innocence, Imperfect Justice, and Mob Daughter.